The Hero Xtreme 200R is the newest 200 cc motorcycle in the market. How good is it, and how does it compare to the entertaining TVS Apache RTR 200 4V? We spend some time riding both bikes together and the result is surprising! The Hero Xtreme 200R is the latest 200 cc motorcycle to hit the market, and Hero MotoCorp rightly thinks it's better late than never, to join the party that is the 200 cc motorcycle segment. After all, it's one of the fastest growing motorcycle segments right now, which the commuter crowd seems to have taken a shine to! 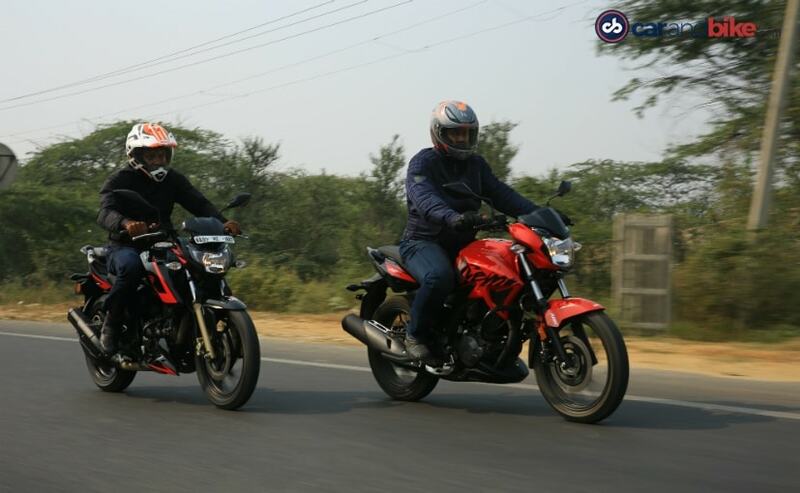 Now, both the Hero Xtreme 200R and the TVS Apache RTR 200 4V are primarily made for in-city duties - the daily commute, to be precise, but with some 'extra' displacement, and extra performance thrown in. And they should be fairly fuel efficient not to burn a hole in the pocket, yet have the extra grunt to move forward with urgency when the light turns green. 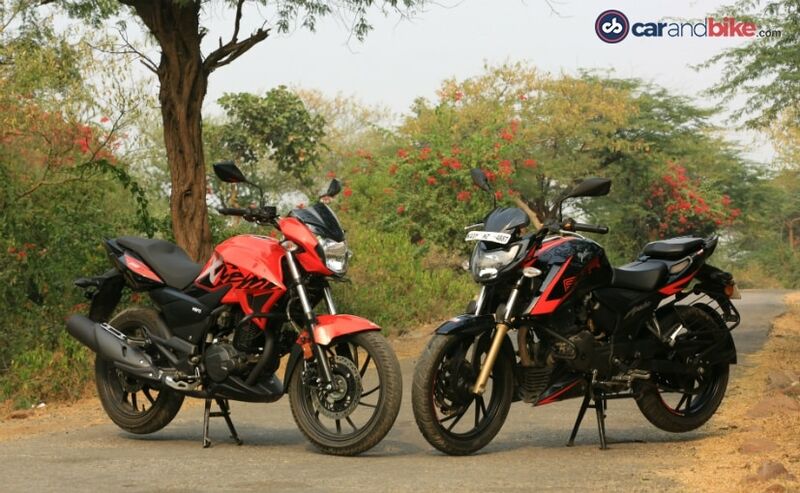 Both bikes have 200 cc engines, both have sharp looks, relatively speaking, and both bikes are slap bang in a segment which has seen first time buyers, and a lot of 125-150 cc owners upgrading to as well. The comparison then is natural, to choose which one is the better of the two, not just in performance and features, but as an overall value for money product. But it may not be as simple as it sounds. After all, the quintessential buyer in this segment may not be primarily looking at sporty dynamics or sharp design. It should be a wholesome product, one that is reliable, easy on the pocket, and well-built. So, here goes then. 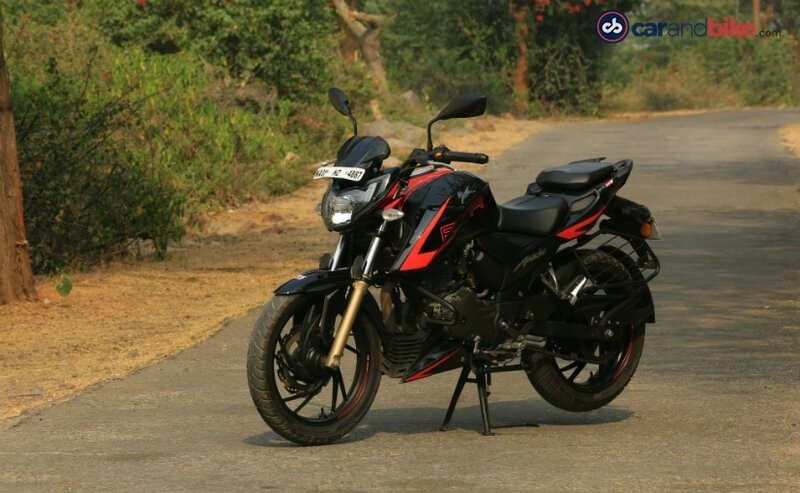 Design-wise, the Hero Xtreme 200 R does look well-built and stylish, especially from the rear three-quarters angle. 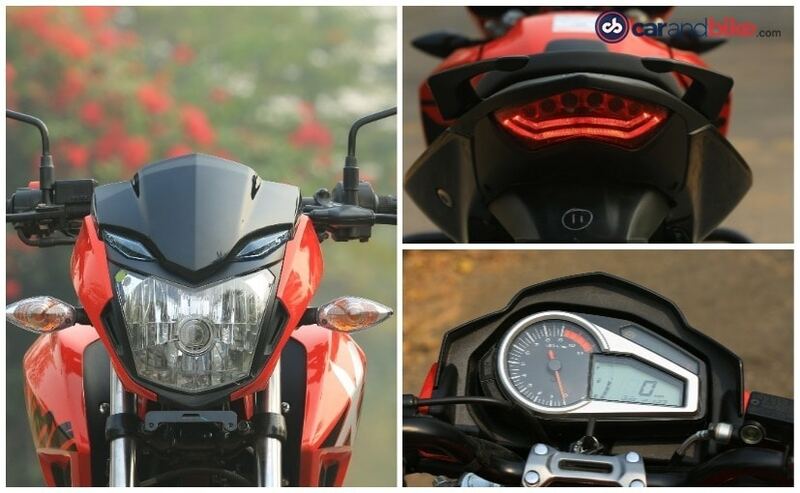 My favourite part is the tail section, and it tapers off to a neat looking LED tail lamp, and the bike looks very neat and classy - full marks to the Hero designers there. It's only when you start looking at the bike in its entirety, you begin to start criticising. Now, don't get me wrong here. Looks are subjective, and the understated looks of the Xtreme 200R will certainly find appeal among a wide audience, but I'm not really a fan of the big "Xtreme" graphics on the fuel tank; they look a little loud for my liking. And viewed head on, the Xtreme 200R's face certainly is more suited to a 125 cc commuter than a proper 200 cc with 'performance' credentials. The part digital-part analogue instrument panel does the job well, and has a handy side-stand down indicator, but it looks a generation older, and it also misses out on a gear position indicator. Same is the case with the headlight with the LED pilot lamps; there's nothing to complain about it, but it looks a tad commuter-ish. 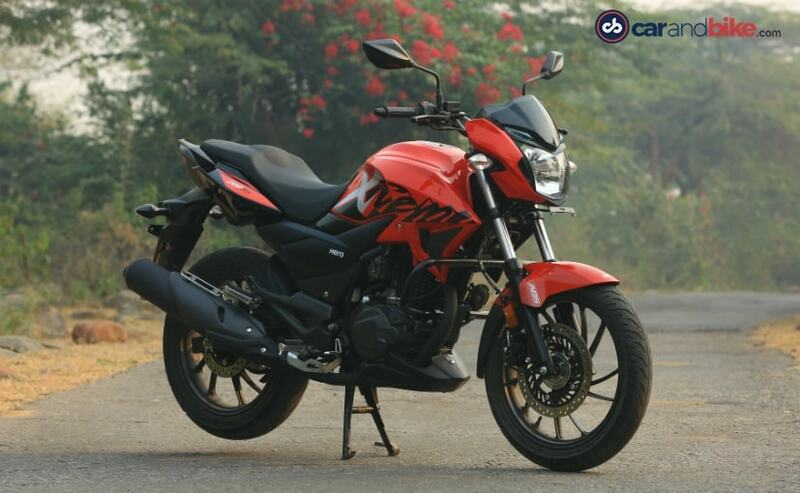 Overall, the Hero Xtreme 200 R's styling isn't exactly exciting, but not everyone wants a sporty looking bike, and but those looking for something stylish and edgy may be disappointed with the plain Jane design of the Xtreme 200R. Naturally, the TVS Apache RTR 200 4V is the one which looks more stylish, sleeker and looks better built. The Race Edition version of our test bike looks even more edgy, and in the black and red colour combination, it does look like a proper fast machine, even when standing still. 200 4V also gets a full-digital speedometer, and it gets whole lot of features, including a gear position indicator, a top speed indicator, and even a lap timer! Plus, the Apache 200 4V Race Edition gets dual-channel ABS, on both wheels, while the Xtreme 200R only gets a single-channel ABS, on the front wheel. Overall fit and finish of both bikes are good, but it's the TVS which feels solid and better-built amongst the two. Both bikes are powered by 200 cc single-cylinder engines, and both engines are almost of the same displacement - just under 200 cc. But that's where the similarities end. The Hero Xtreme 200R is powered by an air-cooled, single-cylinder, two-valve engine, and it puts out 18.1 bhp of maximum power at 8,000 rpm and 17.1 Nm of peak torque at 6,500 rpm. And surprise, surprise, it's a smooth and refined engine, at least in city speeds. 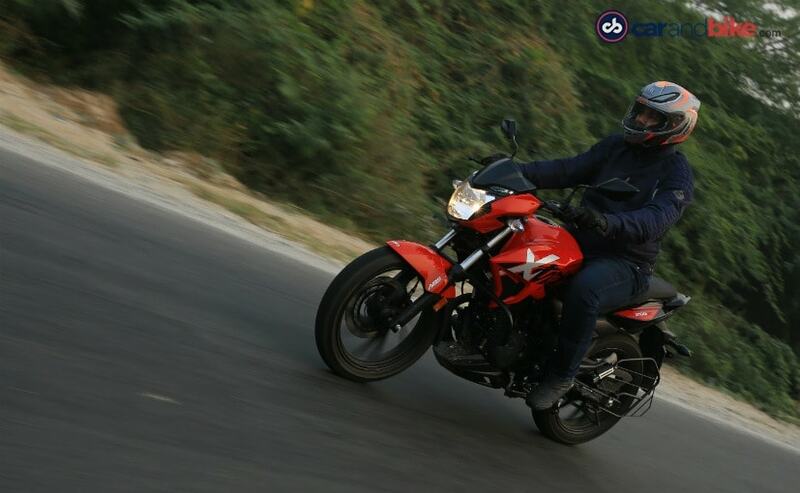 The mid-range is strong, acceleration is smooth and it feels quick from the get-go; in fact, the Xtreme 200R feels quicker to accelerate till about 70 kmph. It's only when the rev counter goes upwards of 7,000 rpm when the Hero Xtreme 200R feels out of breath and takes time to reach triple digit speeds. Out on the highway, 115 kmph is achieved, but the engine is neither happy at those revs, nor does it feel enthusiastic about getting to those speeds. The Apache 200R also gets a 200cc engine, but this one is a 4 valve engine and it makes marginally more power and more torque, - around 20 bhp at 8,500 rpm, and 18.1 Nm of peak torque at 7,000 rpm. So, slightly more power and slightly more torque, at slightly more revs. The TVS Apache RTR 200 4V feels more eager, the engine revs freer, and it's got a higher top speed as well. The tone arrives without drama, and the TVS will happily stay at those speeds without the engine feeling stressed out or strained. 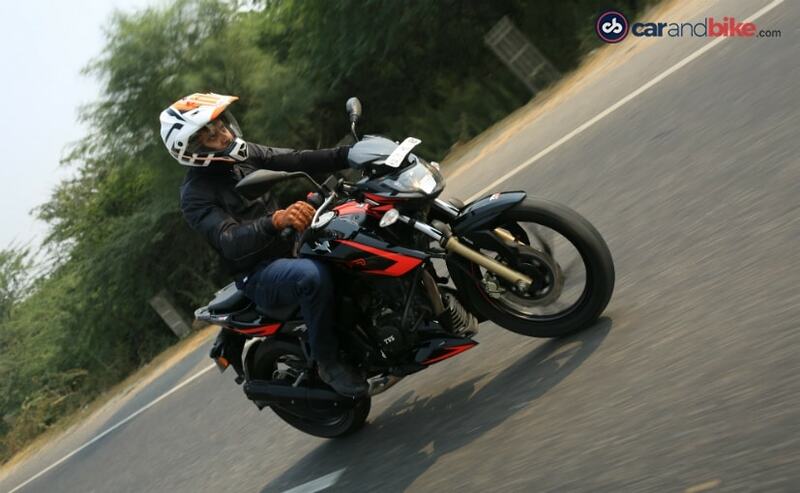 The Hero Xtreme 200R's ride quality is quite plush, and comfortable. It tackles road undulations, broken patches, and even the occasional gravel road pretty well. In fact, the Hero feels more comfortable while sailing through potholes and broken terrain; the suspension absorbs most bumps pretty well. On the handling front too, the Hero Xtreme 200R remains planted and stable, and easily handles the urban jungle and all kinds of traffic conditions with remarkable poise. 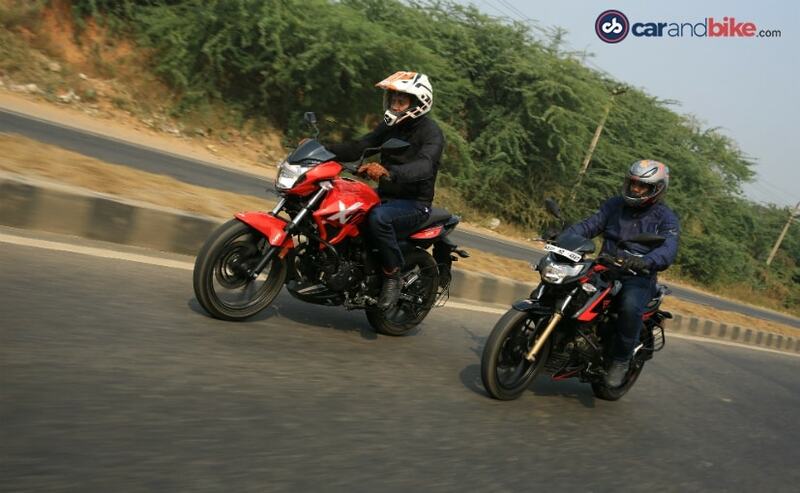 There's nothing to complain about the Xtreme 200R's handling on any count within the city. And the brakes, despite being single-channel ABS, seem to offer more bite and more progression on the lever. 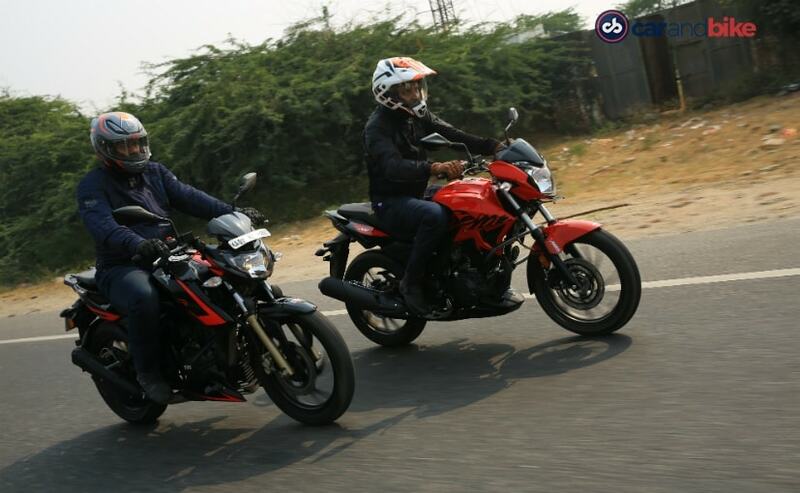 It's only when you compare the Hero with the TVS that it begins to become apparent that the Apache RTR 200 4V is the sportier handler of the two. The TVS Apache RTR 200 4V is intuitive in its handling and will forgive many aggressive moves with its taut road manners. On the flip side though, the Apache's ride is slightly stiffer than the Xtreme 200R, so, it doesn't tackle bad roads as good as the Xtreme 200R, but that helps the Apache 200 handle much better. It's more eager to take on corners with confidence, and the brakes, despite a dual-channel set-up, don't seem to bite as hard as the Hero's and shave off speed so quickly. Hero Xtreme 200R may be understated, a tad sober looking, but still does everything quite well. And if you look at the prices of both bikes, variant to variant, the Hero Xtreme 200R is at least ₹ 20,000 less expensive than the TVS Apache RTR 200 4V. But, while the Apache gets dual channel ABS, Hero only gets ABS on the front wheel. Although there's no complaint as far as braking performance goes, the lack of ABS on the rear wheel does mean that it tends to lock up and skid under hard braking. The TVS also gets a standard slipper clutch, and it looks sleeker, edgier and meaner as well. Well, there is a base variant TVS Apache RTR 200 4V as well, without ABS, but even that one is ₹ 7000 more expensive than the ex-showroom price of the Xtreme 200R. So it boils down to what you are looking for really. On the performance and styling front, it's the TVS Apache RTR 200 4V, which is ahead on all counts, but on a more practical note, the Hero also makes a very good case for itself. It's got a better service network, easy availability of spares, and a lower price tag, and that makes it a very compelling product to consider!